Since 2010, we have been working with Icon Water to improve water quality in the ACT’s drinking water catchment by engaging rural landowners in riparian restoration projects. Through our partnership with Icon Water we have developed two programs for delivery of incentive funding to rural landowners with the ACT’s drinking water catchments. In 2011 Icon Water partnered with the ACT NRM Council and Greening Australia to develop a Landowner Survey. The survey included a range of questions around land management practices, landowner capacity and engagement in landcare projects, as well as several questions around water usage and storage. The results of the survey provided insight into the key issues landowners in our region were experiencing at the time. The partnership also extends to ActewAGL (a subsidiary company of Icon Water). For three years we monitored and maintained an area of 20 hectares as an environmental offset. Icon Water engaged us to deliver incentive funding to rural landowners in priority catchment areas to assist them protect waterways and control stock access. 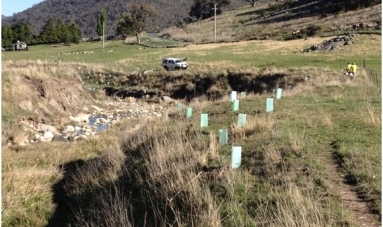 Initially the project targeted the Paddys River Catchment in rural ACT, with six landowners engaged to fence their section of the river. An additional 11 landowners were engaged through the second stage of funding which targeted the Burra Catchment in neighbouring NSW. Burra Creek flows into Googong Dam which is also part of the ACT drinking water supply. The funding provided by Icon Water assisted with the cost of fencing, alternative stock watering systems, and revegetation. It also helped raise landowner awareness of the key issues associated with uncontrolled stock access to waterways. Baseline monitoring has recently been completed on all of the project sites, using the Rapid Assessment of Riparian Condition (RARC) methodology. The aim is for the monitoring to be undertaken at 2-3 years intervals. Our partnership with Greening Australia has enabled us to work directly with the landholders who are the custodians of our drinking water catchments, supporting them in completing on-ground projects which will protect our water supply from the effects of erosion and inappropriate land management practices. Greening Australia’s expertise in project delivery and excellent rapport with landholders has been key to the success of these projects and we are proud to be working with them.